These Police Officers Meditate Before They Start Their Shifts Every day! What If Every Cop Did This? Home » Buddhism » These Police Officers Meditate Before They Start Their Shifts Every day! What If Every Cop Did This? While the act of sitting with your legs crossed, eyes closed and uttering “oommm” is often associated with religious beliefs, anyone – religious or not – can practice mindful meditation. In fact, meditating has proven to be very beneficial for both the mind and body. Doctors and holistic practitioners have long advocated for the benefits of this practice and encourage anyone to take part. Stress reduction: Centering the mind on positive thoughts and breathing deeply can improve one’s mood and reduce feelings of stress. Reduces blood pressure: Meditation relaxes the body, which in turn lowers blood pressure. Boosts the immune system: The results of one study from Ohio State University showed that regular meditation over the course of one month led to a greater resistance to tumors and viruses in the elderly. Natural relief for IBS: Meditation can improve the symptoms of Irritable Bowel Syndrome, such as bloating and diarrhea. Fights inflammation: Because stress leads to inflammation, by relaxing the mind and reducing the effects of stress, meditation offers an anti-antiflammatory effect on the body. This helps to prevent health conditions like heart disease, asthma and arthritis. Many of us suffer from one or more of the above. Full-time workers especially find themselves in need of a stress reliever to take their minds off the day’s activities. If you are looking for natural way to calm your mind, meditation is a great option and one group of professionals will show you why. 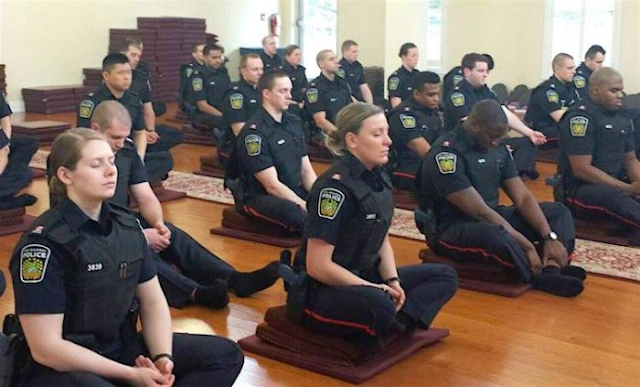 A group of Canadian cops from Peel, Ontario walked into a Buddhist temple to learn how to meditate with hopes of experiencing the positive benefits. Taking on the role of an authority figure combined with the many dangers that police officers face, it’s no wonder that wearing a badge can bring vast amounts of mental, emotional and physical stress. One study from Carleton University in Ottawa, Canada showed that police officers are extremely overworked and exhibited high levels of stress. The Peel Regional Police found that engaging in this practice prior to hitting the streets calmed their minds and allowed them to start the day on a more relaxed and positive note. But that’s not all. Research has found that meditation doesn’t just bring temporary relief from stress; it actually alters the brain, allowing you to ward off the effects of stress long-term. Scientists at Carnegie Mellon University conducted a study in which a group of people who were feeling stressed about their job search were taught how to mediate for three consecutive days. Following this period, brain scans showed a reduction in inflammation for each participant. Researchers concluded that mindfulness meditation can rewire the brain to help people respond more positively to stress. Police officers aren’t the only workers who can benefit from stress relief. Many other professionals including teachers, doctors and lawyers work in stressful environments and meditation is just one of the many ways that can help bring relief in this area.